This book is one volume in the outstanding Yale English Monarchs series and was published in 2011. This series always delivers high quality and reliable historical research. This book is no exception. Edwards is an expert in English as well as Spanish history, making him uniquely qualified to write a biography of Mary who married the Spanish King Philip II. A lot of material is covered here. Edwards illustrates Mary’s childhood and describes how she went from being the beloved princess and apple of her parent’s eye to tortured soul. The descriptions of how she was treated by Henry VIII and Thomas Cromwell in getting her to acknowledge her parent’s marriage as null and void and her own bastardy are harrowing. Mary’s valiant fight for the throne is portrayed. Her tortuous decision to marry Philip was made in secret and was announced as a surprise to her council and the kingdom. There is a great deal of unique insight into the personalities of Mary and Philip and nice details about their marriage and partnership in ruling England. There is a chapter in the book where Edward’s gives context and background information on how Calais was lost on Mary’s watch. The loss of this strategic enclave on the continent was the unfortunate a by-product of the Hapsburg and Valois infighting over control of Italy. As Edward’s depicts the history, it is a riveting read. 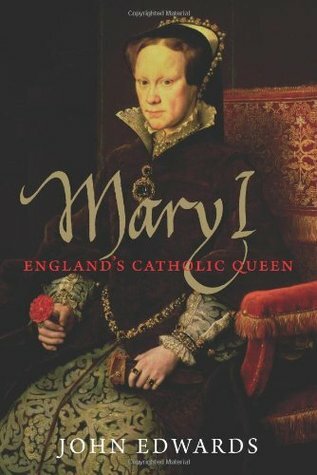 The greatest contribution of this book are the chapters dealing with Mary’s lifelong dream to return England to the bosom of the Catholic Church. There were many practical and complicated matters to resolve for which there really were no permanent solutions. In this battle, Mary worked with her cousin, the Papal Legate Cardinal Reginald Pole. He was her main advisor. Edwards gives his fair and balanced analysis of why Mary burned the alleged heretics. At first, the transformation from Protestantism to Catholicism went relatively well Mary. But when Pope Paul IV was elected, the entire operation took a drastic turn. Paul had been a personal friend of Pole but after this election, he began to turn against King Philip II and eventually Queen Mary and Pole were drawn into the conflict. This totally hampered Mary’s dream for England to be Catholic again. This book is really fascinating. I enjoyed Edwards’s insights into Mary’s personality. If anyone is looking for a complete and enthralling biography of Queen Mary I, I would recommend this one. This entry was posted in Book Reviews, Tudor History Books and tagged book review, Calais, Cardinal Reginald Pole, England’s Catholic Queen, John Edwards, King Henry VIII, King Philip II of Spain, Mary I, medieval history, Pope Paul IV, Thomas Cromwell, Tudor History. Bookmark the permalink.